According to his bio on the LinkedIn website, Mark Matzeldelaflor, was a SEAL operator with SEAL Team 5. His skills include unconventional warfare, mobility operations, surveillance & reconnaissance, demolition, counter terrorism, wilderness survival and other military expertise. But along with his impressive military resume, are other interests like networking, business development, joint ventures, and other adrenaline inducing activities as he puts it. Although it’s not listed on his LinkedIn website, domain names appear to be another one of Mark’s interests, at a time when the popular Navy SEALs are getting a lot of attention from all over the world after Navy SEAL Team 6 killed the world’s number one terrorist, Osama bin Laden. And it just so happens that Mark (who re-directs MarkMatz.com to his LinkedIn site) owns several Navy SEAL domain names, but the funny thing is, many of them have expired and are now pending renewal or deletion. 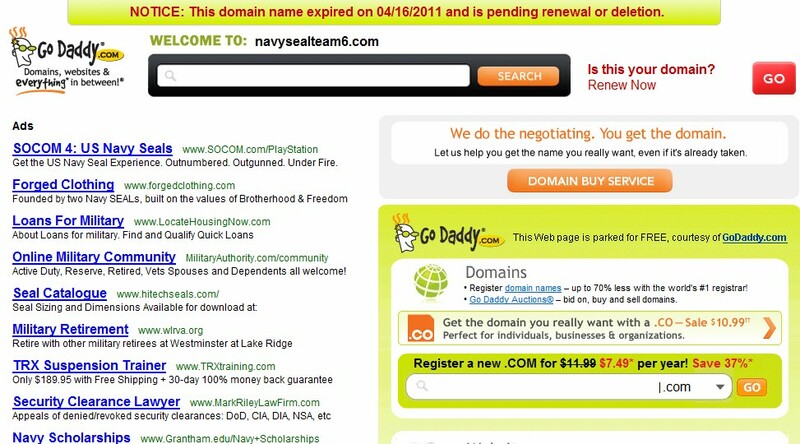 The SEAL domain names that expired on April 16, 2011 include: navysealteam6.com, ussealteam.com, sealteam4.com, navysealteamfour.com and even navysealteam5.com, the same team Mark served with up until 2009. I can’t imagine how a person could overlook renewing domain names like these, especially when news of the Navy SEALs has been on the front page of every website. But I’ll take a guess that they will be renewed before it’s too late. I’ve reached out to Mark for comment and will update this post if I hear back.